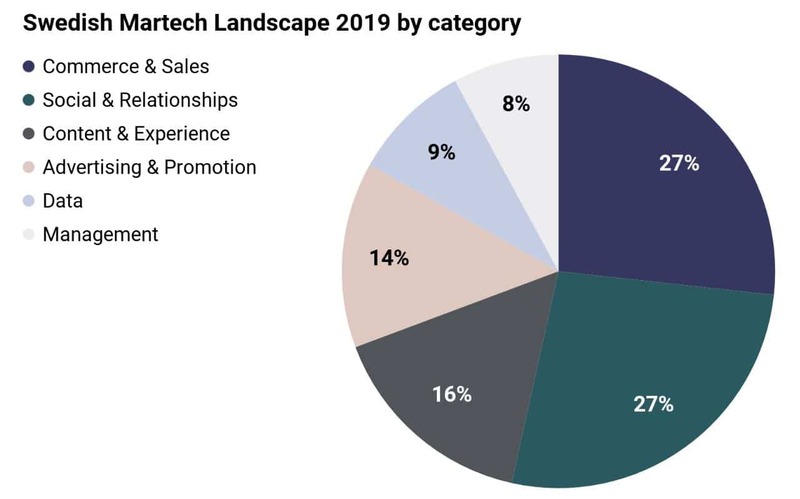 UPDATE Apr 2019: After the publishing of the landscape several people have reached out to us regarding additional martech companies – thanks to all who contributed! The landscape has been updated, and you can find all the companies in the excel file below. You can still report on new companies through the form (see link below). We will add these for next year’s update. Our recent analysis of the Swedish Martech landscape reveals Sweden to be one of the top breeding grounds for marketing technology companies. Avaus has identified 154 companies headquartered in Sweden. 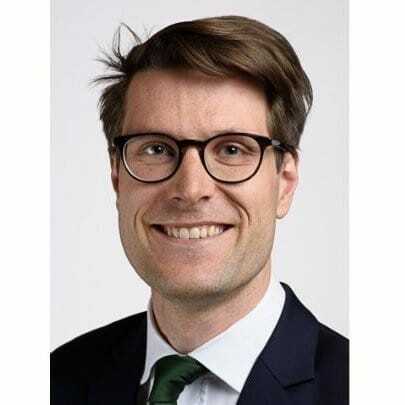 Mika Bäckman, Consultant at Avaus, led the study and was positively surprised by the findings, “This is the first systematic study of the Swedish landscape, revealing total investments of almost one billion USD in the martech segment”. Martech guru, Scott Brinker, publishes an annual MarTech 5000 study – a well-known analysis of companies of different sizes and forms. In 2018, there were already 6289 martech vendors globally. Avaus has followed the martech scene in Sweden for several years and was motivated to contribute to Scott’s mapping by analysing the Swedish landscape. Our mapping shows that Sweden has a relatively large marketing technology ecosystem. We identified 154 martech companies in the Swedish market. This represents 2.2% of the companies in the MarTech 5000 list published by Scott Brinker. We have earlier conducted national Martech studies for Germany, and Finland, which also uncovered largely uncharted landscapes of martech vendors. Figure 1: Avaus identified 154 marketing technology companies that are based in Sweden. Avaus analysis revealed five times more companies than Martech 5000 for Sweden as Avaus research identified 154 companies, while the Martech 5000 list included only 28 martech companies based in Sweden. 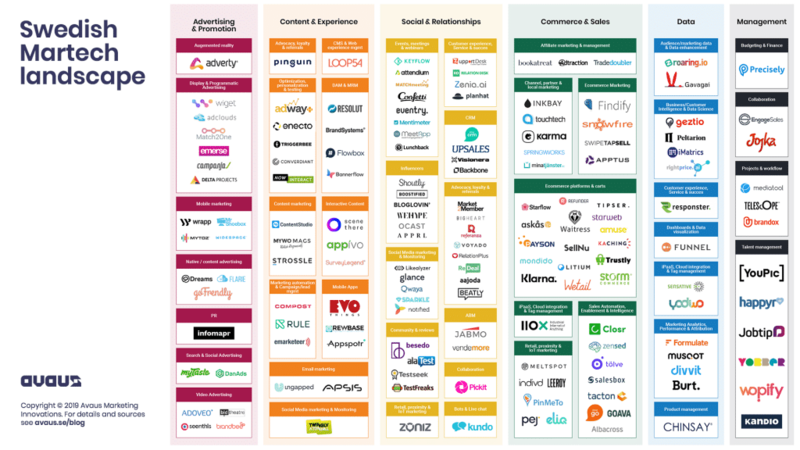 The two largest categories in the Swedish Martech landscape 2019 are Commerce & Sales, and Social & Relationships both covering 27% of all identified companies. Figure 2: The two largest categories account for 54% of the companies listed in Swedish Martech landscape. Of the 154 Martech companies that Avaus identified in Sweden, 47% have acquired investor capital. According to Avaus research, the total investments in these martech companies accumulated to 987 million USD. To put this figure in perspective, total investments in the technology ecosystem in Sweden between 2013-2018 were 5.8 billion USD. Based on this rough comparison the share of martech companies of total technology investment has averaged 6% annually of the total technology ecosystem investment (Annual investment to MarTech between 2005 and 2018 divided by average capital invested in technology ecosystem between 2013 and 2018). We also noticed that martech companies are attracting investment in the same proportion that tech companies (both hardware & software) attract in general. This speaks for a healthy martech investment climate in Sweden. Commerce & Sales is the largest category in terms of investment. It has attracted 80% of historical investments in martech in Sweden. A closer look at the figures shows that one company in particular has acquired a substantial share of total investment: Klarna. The company has attracted 67% of all investment in marketing technology in Sweden. Klarna is one of the seven 1B+ USD companies that have emerged from Sweden and thus is a true game-changer. Klarna belongs to the Ecommerce platforms & carts subcategory, which is the largest category in terms of the value of investments. Interestingly, Ecommerce platforms & carts remains the largest category even when we exclude the Klarna investment. The category includes 9 companies that have received funding to a value of 64 million USD (when excluding Klarna). Figure 3: The ten largest subcategories account for 80% of the total investment value in Swedish Martech landscape 2019. The table above excludes Klarna investments. The eCommerce platforms & carts category is proportionally larger in Sweden than in the Martech 5000 list. So why are there so many companies in this subcategory in Sweden? According to Eurostat, Sweden has the third highest online shopping traffic in Europe (Proportion of individuals who purchased online within the last 12 months). Further, the Swedes have divided preferences when it comes to payment options. Invoice remains the most popular method (38% of shoppers use invoices), but several different payment options (including card payments, bank payments, and online payments) split the rest of the market. It seems there is a clear need for various check-out solutions in the domestic market. Another interesting question is how founders of Swedish eCommerce platforms & carts companies view expansion opportunities in international markets? We are keen to hear any insights on this! Please let us know your thoughts by filling in the form below. The smallest category in terms of investment was Management (only 1% of investment). The business model of companies in this category assumes that large volumes of corporate employees sign up to use the product. For some reason it seems that investors’ appetite for this type of companies is low in the Swedish market. 66% of Martech companies are headquartered in the capital. Stockholm’s position as the undisputed tech hub of Sweden does not come as a surprise. The city ranks fifth among European hubs by capital invested in the technology sector after London, Paris, Berlin, and Barcelona. Nevertheless, the martech scene is not restricted to Stockholm. Malmö, Gothenburg and Lund are home to a fifth of the companies identified (with, respectively, 13, 12, and 5 companies each). These cities benefit from shorter travel distances to the rest of the European tech hubs, compared to Stockholm. Several universities in the region help companies recruiting local talent. The rest of the companies are distributed throughout 16 different cities in the country. Sweden is notorious for its competitive corporate tax and fertile business climate (ranked 10th country in terms of ease of doing business by the World Bank) which gives a good starting point for any founder in the martech sector. In terms of workforce size, the bulk (78%) of the companies have between 1 to 50 employees. Although access to a highly qualified workforce creates a good foundation for martech founders throughout the country, all companies with more than 100 employees are based in Stockholm. We have made three major discoveries when looking into the Swedish marketing technology landscape. Firstly, we were positively surprised that martech companies are attracting investment in the same proportion as general tech companies. In our view, Sweden has a vibrant martech scene that is reflected in the monetary value of the investments that was 13.4 times larger than in the Martech 5000 survey. Secondly, we found a set of high-performing subcategories (Figure 3) that have gathered 80% of investments in the Swedish Martech landscape. Going forward, it will be interesting to follow how investments, know-how, talent and competition will converge in these high-performing areas. The next martech success story after Klarna might come from Mobile Marketing, Influencers or the Channel, Partner & Local marketing subcategories. These segments have attracted 10+ million USD in investment. Thirdly, we were intrigued by the wide geographical spread of martech companies. Stockholm might be the leading city in the Nordics with 100+ martech companies in the region, but other cities are vibrant too. This is our own approximation of the landscape and a first version. If you spot any errors or missing companies, we’d be grateful if you could fill out this form so that we can update future iterations. This first version is a modest start, relying on data from Crunchbase and local market knowledge, but for future versions we’re hoping to draw on additional data sources to provide a more multifaceted analysis. The full list of companies in the Swedish Martech landscape here.